A war has started between next generation smartphone you can’t even imagine what configuration they obtaining, that’s called technology which changing the whole world From the telegram to telephone and from telephone to Mobile that’s called evolution. Now let’s talk the upcoming phone from Huawei family called Huawei Honor 8 pro after great success of Huawei Honor 8 now they launched the sequel of its Honor 8 pro with superb specifications in India on Thursday. Now let’s talk about the specifications of the Huawei Honor 8 pro. The smartphone having dual camera setup, a massive 4000mAh battery as compared to OnePlus 5, and an impressive 6GB of RAM. Additionally, the retail box for the Huawei Honor 8 Pro can also be turned into a Google Cardboard viewer for VR experience as well. The Huawei Honor 8 Pro will be made available in Navy Blue and Midnight Black color variants in India. The phone comes with a fingerprint scanner, which is located at the back and can be used to unlock the device. Let’s talk about the camera of smartphone phone Huawei Honor 8 Pro comes with a dual rear camera setup that consists of two 12-megapixel sensors with f/2.2 aperture, laser autofocus, LED flash, and 4K video recording. As you might expect, one sensor takes the images in RGB while the other sensor takes the images in monochrome. At the front, the smartphone comes with an 8-megapixel sensor coupled with a 77-degree wide-angle lens. The Huawei Honor 8 Pro Runs on Android 7.0 nougat based EMUI 5.1 out of the box. 90% of the phone features are only 3 clicks away, simple and direct to the app. Built-in phone manager has powerful and useful functions such as Virus Scan, Permissions, App Lock, Homestyle using App Drawer, Twin Apps and lots more. 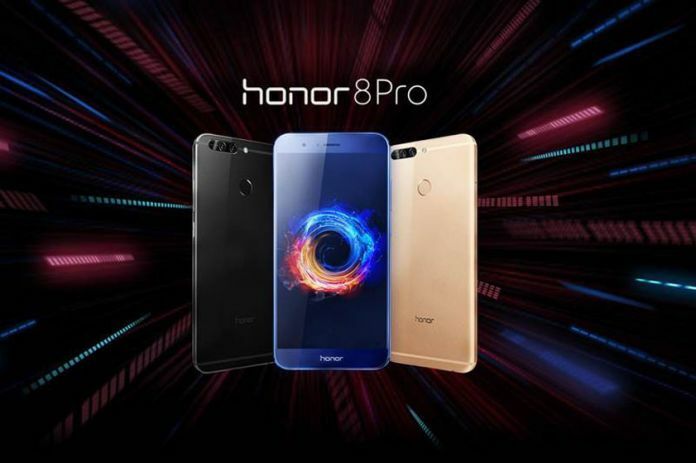 Huawei Honor 8 Pro harnesses Artificial Intelligence (AI) technology to bring further efficiency which helps the smartphone to remain faster even after long term usage, for years to come. *Upgradable to Android O before 2017 Q4 end. The smartphone is powered by a Huawei Kirin 960 (four Cortex-A53 cores clocked at 1.8GHz and four Cortex-A73 cores clocked at 2.4GHz) coupled with 6GB of LPDDR4 RAM. And screen comes into 2k 14.47cm display screen with 515ppi boasts of cinema-like performance with built-in DCI-p3 (Digital Cinema Initiative) as standard and LTPS LCD display with Gorilla Glass 3 protection. The price of Huawei Honor 8 Pro smartphone phone as compared to OnePlus it’s like nothing and company only bring only 6GB RAM and 128 GB inbuilt storage only for 29,999 and the price of 6GB RAM and 64 GB store cost you 32,999 as compared to battery, storage, performance, cost people will prefer Huawei Honor 8 pro. The Huawei Honor 8 Pro available on amazon.in you can purchase it from their, and its first sale exclusively for Amazon Prime members will start at 6 pm IST on Monday, July 10 – which also happens to be the start of Amazon Prime Day. Open sales begin from 12 am on July 13. As for launch offers, during the Prime Day sale, Prime subscribers will get 15 percent cash back if they use HDFC Bank credit and debit cards. During the open sale, Amazon is enticing users with its Vodafone 45GB over five months offer, as well as no-cost EMI options.